One of the main problems for the French military in Indochina was an acute manpower shortage. Especially as they were forbidden to use French conscripts by successive French home governments, this difficulty became more grave as time went on. The Foreign Legion was the most important source of Europeans, and the African colonies provided significant numbers of men, but it was never enough. As time went on and casualties mounted, increasing numbers of Indochinese troops were brought into the TFEO, or organised into "national" units, but for various reasons this large reserve was never tapped efficiently. However, the aim here is to describe the Indochinese men and units which did serve to support the French administration - as can be seen, not all these peoples were anti-French! There had been Indochinese troops in French service since 1859, and after the Japanese interlude, many of the previous tirailleurs returned to French service. The French initially used the Indochinese personnel mainly as coolies and other workers, and in the militia/guard units used to man static positions along the main roads, rivers and other communication routes. 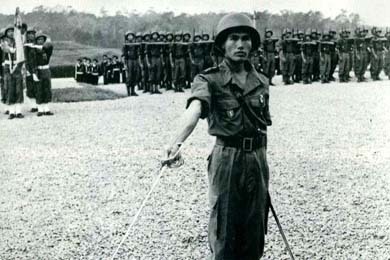 Some formed partisan units either acting alone (as in Touby Li Foung's Hmong guerrillas in Laos) or attached to regular units as scouts (which was particularly the case with the Legion and Paras). As time passed,however, Indochinese personnel were brought into nominally European or African units to replace losses. Some supposedly "white" units were 50% Indochinese by the middle years of the war. Pre-WW2, the French had recruited mainly from the "Annamese" population of the Vietnamese provinces (Tonkin, Annam and Cochinchine). The Khmer and Lao were supposedly pacifistic buddhists, and so not thought to be suitable for military service, though their later activity seems hardly pacifistic! Hill tribes (the famous montagnards) such as the Thô and Meo of Tonkin or the Hmong of Laos had been used as auxiliaries (trackers/scouts or militias) in the pre-WW2 period, and continued to be used in this rôle during the Indochina War. After the Japanese takeover of 9th March 1945, the old French colonial military structure was demolished. The French troops were interned, executed, or in China, while the Indochinese personnel either served under the Japanese or went home. Many joined the ranks of the Viet Minh. When the Indochina War started in 1946, the French forces consisted almost entirely of French and North African troops, with Indochinese present as coolies, service personnel or fighting auxilliaries. As the war escalated, the Indochinese proportion increased dramatically. General Leclerc realised the need to recruit Vietnamese partisans, and General Salan got this in motion. In a memo to all battalions of 14th November 1947, he asked for the maximum use of Indochinese personnel to fill the gaps in French units. While many Indochinese were recruited, there was no real system to this. Ethnic minorities (Thai, Nung, Meo, Hmong, Thô, Man, etc.) who were generally hostile to the Viet majority. Some of the captive VM (prisonniers et internés militaires - PIM) who, having worked as coolies for the CEFEO, decided to join the French side and fight against their previous comrades. In Cochinchina, the main sources of auxilliaries were the christian militias, the sects, and the Binh Xuyen (see Sects,Drugs and Warrior Monks). Many of these had initially been part of the Viet Minh front, but were either dissillusioned by the communists, or wooed away by the French. Thus there was a progressive jaunissement ("yellowing") of the French forces, but it was under the joint military-political rule of General de Lattre (17 December 1950 to 19th November 1951) that the formation of a Vietnamese National Army was started in earnest. Initially, the Armée Nationale Vietnamienne (Vietnamese National Army - ANV) was formed by transferring Indochinese units from the TFEO to the new force. This included the Vietnamese battalions from Colonial regiments,Vietnamese battalions and companies which had been attached to Legion units, and the bawouans - the Indochinese paratroop battalions. These hardened units tended to be the élite around which the rest of the ANV was formed. On the 15th July 1951, General de Lattre convinced the fledgling Vietnamese Government to order a general mobilisation of the new ANV - i.e. conscription in Vietnam. Unfortunately this did not quite work as planned. Large numbers of the conscripts did not turn up, and many of those who did proved to be unfit for service. However, the ANV did increase from 65,000 men in January 1951, to 128,000 by December of that year. (In the same period the Cambodian troops went from 5,000 to 10,500, and the Laos forces from 4,000 to 9,500). Regular Army: on 1st January 1952, some 60-65,000 men, with a massive recruitment programme planned for the year. Auxiliaries: some 60,000 (excluding partisans), of which about 1/10th were paid by the Vietnamese Government(mainly Caodaists and Hoa-Hao). Support: 2 supply companies, 4 repair companies (plus depots), 1 medical company (plus regional medical services and depots), plus regional administration centres. Navy: there were 9 River Squadrons, provisionally run by Guard cadres. A course was being run by the French Navy to retrain Vietnamese Merchant Navy Officers for Naval service, and a training centre was about to open at Nhia Trang for 200 officers and sailors. Aviation: A training school was due to open in the second half of 1952, and was to train 45 student pilots and 45 student mechanics to form Artillery Observation groups by the end of the year. Guards: the Guards of North, Central and South Vietnam were to form part of the regular forces of the ANV, on a territorial basis. The Cadre of Officers: There were 650 officers, with 320 cadets. The active officers included 560 lieutenants and sub-lieutenants, 76 commandants and captains, 4 colonels and 1 general. However, to fulfill the terms of the 1951 Plan,there was a requirement for 1200 officers. 1000 supplementary officers were required to increase the number of divisions to 8, as anticipated. The officers came from the French Army (38), the École Militaire Inter-armes (360), the Regional Military Academies (260), and the regional units which had been transfered to the ANV. École Militaire Inter-armes (Dalat): 200 every 9 months. Regional Military Academies (Hanoi, Hue and Saigon): in total, these turned out 300 officer cadets and 300 NCOs every 8 months. Écoles d'officiers de Réserve (Reserve Officers Academy - Thu Duc and Nam Dinh): intended to produce 500 reserve officers, but in fact turned out 690 after an 8 month course. The French Army provided some 550 officers and 3200 NCOs (all French) for the initial formation and training of the ANV. These were to be gradually replaced by Vietnamese personnel as they became available. Certain units were formed from scratch with entirely Vietnamese establishments. Role of the Liaison Mission: under the terms of the Franco-Vietnamese accords of 8th March 1949, the French Mission was required to provide instructors and technicians for the Vietnamese Government, to allow the establishment of the ANV. Costs of Forming the ANV: during 1951, the Vietnamese Government voted 13.5 billion piastres (40% of their income)for the ANV, while France provided 28 billion. For 1952, the Vietnamese contribution remained at 40% of their total,with the French Government voting 48.8 billion for the three Indochinese National Armies together. Pay: The pay and conditions for both regular and auxiliary troops was to be of the same kind as that provided by the CEFEO. However, by the end of 1951 this had not all been supplied, and the equipment for 4 divisions had been requested from the USA for 1952. Project for the Unification of forces: the Vietnamese Government was charged with the amalgamation of Cao Dai and Hoa-Hao militias into the regular ANV, at their own pace. Command and Mission: the C-in-C of the Vietnamese Armed Forces was Bao Dai, with the President of the Council of Ministers overseeing the running of the Forces. The Vietnamese Armed Forces were to act under overall French command in Vietnam and areas of Vietnamese national interest. 36 commando companies of the Guard. 1 Reconnaissance squadron (including a river flotilla). The Corps franc Khmer (light troops). To command this fledgling national army, obviously a Vietnamese officer was required. 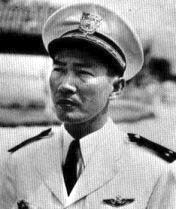 The choice made was Nguyen Van Hinh, who had served with distinction in the Free French Airforce during WW2 in Italy, France and Germany, achieving the rank of Lieutenant-Colonel. He was ambitious and opportunistic, and also the son of Nguyen Van Tam (President of the new Vietnamese Government under Bao Dai). Made Brigadier-General in the ANV, General Hinh took command in 1952. He immediately set about re-organising the army, which he felt was "too heavy", being based on French patterns. His answer was to form more numerous, lighter battalions - the Tieu Doan Kinh Quan (TDKQ - Vietnamese Commando Battalions). Weaponry: use of the Thompson SMG instead of rifles, and 60mm mortars instead of 81mm. The idea of this system was to provide a well-motivated force, capable of taking on the mobile VM formations on their own terms and defeating them. However, partly as a result of their training being rushed, partly due to over "hype" of their potential, and largely due to the VM recognising that a Vietnamese-led, well-motivated anti-communist force was a huge potential threat, these units were mauled in their early operations. The VM targeted them for destruction, and their prestige waned, being refered to as "neither commandos nor battalions". The ANV in the spring of 1954 numbered 145 battalions, of which 45 were TDKQ. It was not, however, the independent force which it had been publicised as. Logistics were heavily dependent on the French, and there was a heavy presence of French officers, particularly in staff positions. The ANV was in any case under overall command of the CEFEO, and it is not surprising that the VM refered to them as fantoches (puppets) - the Vietnamese population as a whole probably held similar opinions. The ANV was given control of certain regions, notably Bui Chu, but proved generally ineffective. The idea was sound, but should have been carried out several years before. It was too little, too late, and did nothing to help France in her fight with the VM.